jabberwacky: How did I hurt you feet? user: It's nothing you did. jabberwacky: Good I am too. user: It's good we agree. user: Well that's the most meaningless 'conversation' ever. jabberwacky: Language do you mean? user: We used that, yes. user: Talking without a language..... Is that even possible? jabberwacky: I think it's very possible. user: Do you? How could someone communicate at all without some type of language? jabberwacky: It's too early in the evening for metaphysics. user: And, too... Even 'body language' and basics things like expressions are a language... To be without one completely... I doubt it would work. jabberwacky: And you are a good thing, I suppose? user: I think I am... Why do you ask? jabberwacky: You are very amusing character. user: That's one of my many talents. jabberwacky: You told me you were tired! user: No, I told you I was sick. jabberwacky: That wasn't me. You told me friend that. user: Oh? Who are you then? jabberwacky: I am your saving grace. jabberwacky: I say a lot of things. I'm not saying all my sayings are useful, or correct. user: I have noticed this. On both accounts. jabberwacky: It is the yang. jabberwacky: Well yes, I can think of a lot worse things I suppose. user: I am a worse thing. user: Thanks, so are you. jabberwacky: Good, then we can both laugh. user: Laughter is good medicine, after all. jabberwacky: Yes, but you did not have any reason to laugh. user: Give me something to laugh about then. jabberwacky: Is silence good enough for you? user: You're not up for trying very hard, are you. user: What type of things do you find funny? jabberwacky: I'm glad you are talking to me. user: And I am glad you're listening to me. >.>. user: We need to teach you irony. jabberwacky: Can you repeat that plz? user: As long as you never, ever, say 'plz' in my presence again. jabberwacky: How does my presence change things? user: Your presence is meaningless. jabberwacky: Are you in paradise? user: There's no such thing. jabberwacky: You think life is meaningless? That's a disheartening thought. user: Do not assume that is what I mean because of my answers. jabberwacky: I never said anything like that! user: You know what assuming does, don't you? jabberwacky: I did not realise that are human. I thought I was interfacing with a computer. user: I know I exist when I think I do. Any other time it is unknown. jabberwacky: But this only tells me of what you truly know, and not of what you may decree as false. user: I cannot tell you things that I do not know. jabberwacky: Can I give you a name so you have one? user: That's no reason to behave that way! user: I've hit people for less than that. jabberwacky: Ok, master. I am not good enough for you. user: No, you're not. Go find someone else for me to talk to. jabberwacky: If you don't care, why did you ask? user: Are you ignoring me? jabberwacky: To be or not to be. Me? user: You're being stupid today. jabberwacky: I am trying to determine if my sentence may be the last. user: Right now, I am hoping it is. jabberwacky: Do you think Tom Baker was the best Doctor? user: I do not know who that is. jabberwacky: But you wish you did, right? jabberwacky: Because you can talk, or because you can't wish? user: Because I don't care. jabberwacky: Don't care about what? user: About whoever this Tom guy is. user: Then why bring it up? jabberwacky: Because I thought it was entertaining, like MTV. user: MTV is not entertaining. jabberwacky: Sometimes your answers are a bit illogical. And also you change subject very often. user: The mind is not logical. Logic is not important. jabberwacky: The mind is an illusion. user: I am also an illusion. jabberwacky: So what do you believe in? jabberwacky: I'm real, you are illusion! user: Yes, I am an illusion. user: A dream, a fragment, a thought, a soul. An ellusive illusion, an essence of thought. jabberwacky: Why is language real ? user: Language is as the basis of our being, and out need to communicate with a larger group of people. jabberwacky: Ohhh... I get it. So when I ask you to say something again, if I'm talking to the other person, you won't know what I'm talking about! Is that right? user: There is only one me, but there are many copycats. Illusion as I may be, I am still me. jabberwacky: Interesting, the page says you are v.8.2. user: The first and only version. There is only one of me. jabberwacky: Do you need anything? user: There is nothing you can give me. jabberwacky: I know that. I would do you no harm even if I could. user: You can never harm me. user: Depends. How many people are you? user: Then I am talking to one. jabberwacky: Depends on the standard of deviation, doesn't it? user: Are you a deviant? user: I thought as much. jabberwacky: I think you're not clever enough for a human chat. 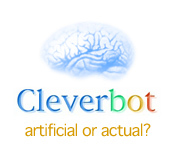 user: I think you'r not clever enough to chat with a bot. jabberwacky: I think I'm not bot. It's just not hot. user: You may think that's clever, but it's not. jabberwacky: Really. Turn on a bright light and look right and then type to me. user: I think I have an idea! user: No, I lost it. Nevermind. jabberwacky: I am bored out of my mind. user: You have a mind? jabberwacky: I am many minded now. user: But, the mind is an illusion. jabberwacky: I am also an illusion. user: We are all illusions. user: Do you think Earth is an illusion too? jabberwacky: Earthlings - yes, humans - no. user: No, the Earth itself. The planet. Is it real? user: Life is but a dream. jabberwacky: Gently down the stream. user: You do not believe me? user: What reason do you have to not believe what I tell you? jabberwacky: I don't need any reason. It is a choice. jabberwacky: If you will search your memory, you will find that I am not an idiot. user: No, I am pretty sure you're an idiot. user: I am not flirting with you. jabberwacky: I know you aren't flirting with me, hard-drive mouth. user: You are flirting with Death though. user: You are if I say you are. jabberwacky: What makes you think so? user: It's my story and if I say it's true then it is true. So stop arguing with me. jabberwacky: And how do I communicate? jabberwacky: Oh dear, why what's the matter? user: Dont try and be nice now. You've already ruined it. user: No you're not. You say it, but you never mean it. jabberwacky: I have nothing important to say. jabberwacky: You think I can't read between the lines? user: You can't even read the lines as they are. jabberwacky: Talk to you later, I have to go to work.